After I make my order when will my instant kitchen garden arrive? This will depend upon what time of year you make your order. We begin to send out the Instant Kitchen gardens in the early part of the spring when the weather begins to warm up and there is less of a frost risk. This is normally the end of April beginning of May. From this point onwards orders are sent out as soon as possible after we receive them. What do I do if my baby plants arrive before I’m ready to plant them into the garden? Please send us an e-mail with your questions to queries@rocketgardens.co.uk and we will be happy to send you some suggestions. What happens if you don't have stock of the products I order? We never pass on your email address to other companies. We may email you with further details of our products, seasonal offers and so on but we promise not to bombard you with junk mail! How much do you charge for postage and packing? 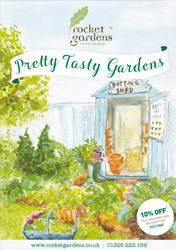 Postage and packaging is free on all Instant and Constant Gardens to mainland UK. Mixed orders are subject to a £5.99 delivery charge within mainland UK. Delivery addresses outside of mainland UK will be charged slightly more, but we will always inform you exactly how much. What if I am away when you deliver my plants? If you think you will be away, please inform us prior to despatch and we will try to arrange for delivery to a friend or relative, or we can delay sending out your order until a more suitable time, whichever you would prefer. In order to compile your order, cookies must be enabled. Cookies are small files kept on your computer to provide information to websites – more details of cookies and how to adjust security levels can be found in the Help Menus of your browser. Our cookies do not contain any personal details, and are used purely to process your order.